David Jones: A Lark in Gustav's Garden - A World Premiere! For tickets or more information, call the Symphony office at 360.457.5579. The Port Angeles Symphony Orchestra was founded in 1932. 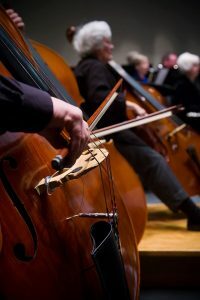 With five symphony orchestra concerts, six chamber orchestra concerts, two pops concerts, and a strong educational program, the orchestra continues to provide North Olympic Peninsula families with treasured musical experiences. Founded in 1932, the Port Angeles Symphony Orchestra enriches the lives of residents of the North Olympic Peninsula through education, outreach, and performances of classical music that inspire local musicians and audiences alike.